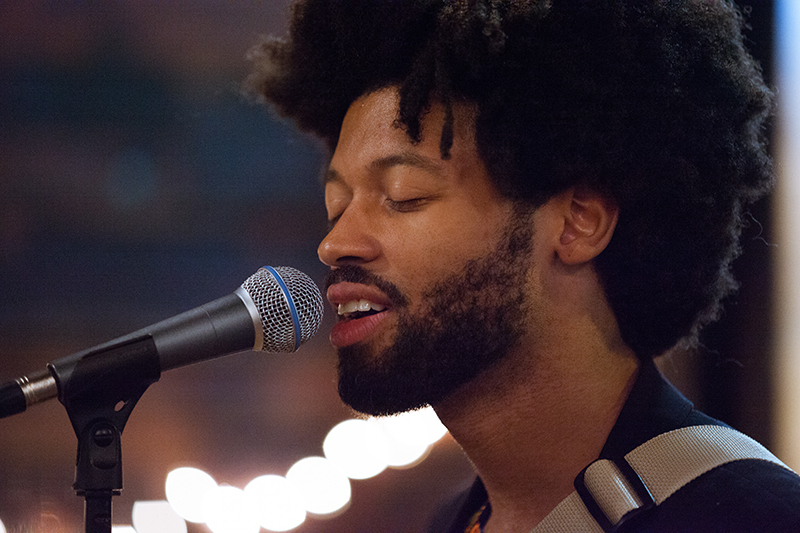 Sam Trump during his January 8th performance at the Currency Exchange as part of First Monday Jazz. The audience enjoying Sam Trump's January 8th performance at First Monday Jazz. Chicago-based trumpetist Sam “Trump” Harris is almost ubiquitous, from featuring on albums with Mac Miller, Curren$y, and Joey Purp to playing the dimly-lit back corner stage of the California Clipper in Humboldt Park. Having just released his second album, “Purple Skies,” Trump is a mainstay of the Chicago music scene. 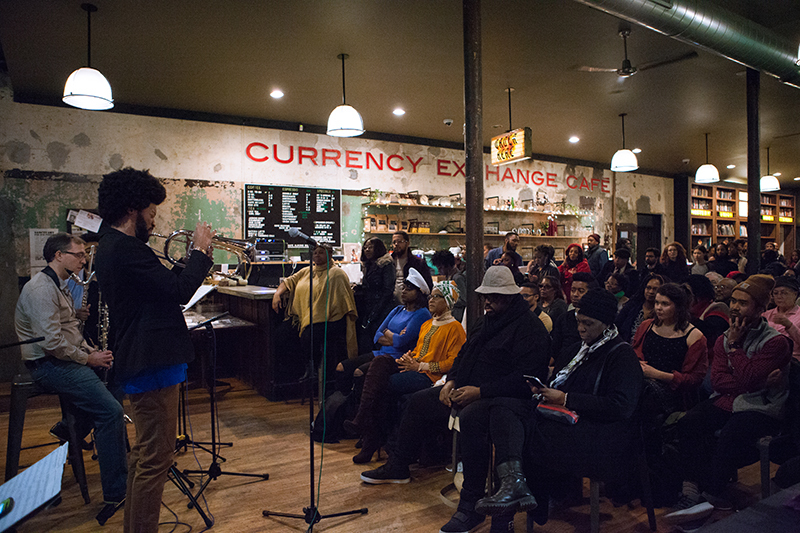 On January 8th, he performed at First Monday Jazz at the Currency Exchange Café, a privately-owned business on the UChicago Arts Block in Washington Park. 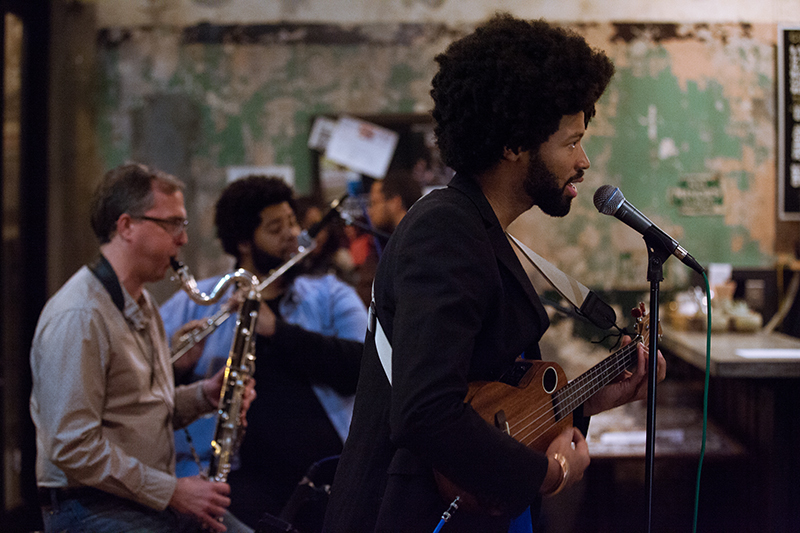 Arts + Public Life, the UChicago initative that operates the Arts Block, organizes First Monday Jazz in partnership with the Currency Exchange Café. This free monthly event showcases a wide range of Chicago artists who perform in genres including jazz, soul, funk, and fusion. Friends and neighbors are always welcome for an enlivening evening of music from some of Chicago’s most exciting artists. We were lucky enough to have the chance to ask Trump a few questions before he was out the door on the way to his next gig. You’re not a Chicago native – what initially drew you to the city of Chicago? What made you stay? Correct, I was born and raised in Houston, Texas! I originally came to Chicago at age 22 (in 2009), on a scholarship to play lead trumpet in Columbia College of Chicago's jazz ensemble. Throughout my college years, I spent many moments outside of school investing time, performing in Chicago's music scene, and things progressed substantially so it just made sense to stay in Chicago. Also, I met [local band] Sidewalk Chalk about two months after moving here and we are still growing together, and just released our fourth album on vinyl this summer—this band is one main reason I've stuck around. I am very proud of this album, as it documents the early maturation of my solo artistry in 2011 to 2013, covering topics of love and romance, family, inspiration, societal interdependence, and the Black American plight. All songs are produced by Los Angeles based producer, Calvin Valentine. This album features previously released singles, "Count On Me" and "Brother" featuring Add-2. What are your top three musical venues in the city? Any favorite spots you think are underrated where you love to perform? 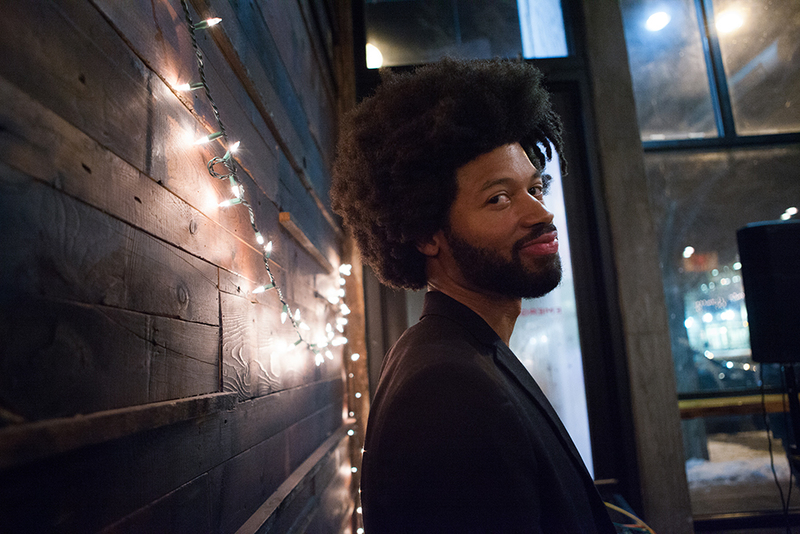 Top three venues to perform at are The California Clipper, Untitled, and City Winery. Aside from each of these places having great sound, they all have very classy aesthetics, and they pride themselves in taking care of the artists, which is very important to me. How does the energy of the audience impact your work, depending on the venue or part of the city you're in? I am indeed affected by the energy and engagement of the audience when performing. My best situations are intimate spaces, where I can connect eyes with the audience members, and we can interact in the moment together. After all, that's what we all came for—those magical moments that can only happen when the energy is kinetic. As the performer, I take the responsibility of controlling the energy of the room, so if it’s not right, I do whatever I can—in the moment—to get the juices flowing. When the audience reciprocates the notion, then it becomes clear that we are all here for each other. My past performance at Currency Exchange Café was the quintessential space for this type of quid pro quo. Do you have any Chicago music influences? I'm influenced by most artists I encounter on the scene, mainly because Chicago is filthy rich with talent! To name a few: Harold Green, Isaiah Sharkey, Pocket Radio, Erthe St James, Charlie Coffeen. All photographs by Sarah Pooley. Written by Clare Austen-Smith and Maya Ruiz-Stanberry.